The Mariner 2 satellite [during its 1962 mission to Venus] orientated itself by tracking the Earth and in the process collected observations of the Earth’s brightness. Photometry is a technique of astronomy concerned with measuring the flux, or intensity of an astronomical object’s electromagnetic radiation. Photometric measurements can be combined with the inverse-square law to determine the luminosity of an object if its distance can be determined, or its distance if its luminosity is known. 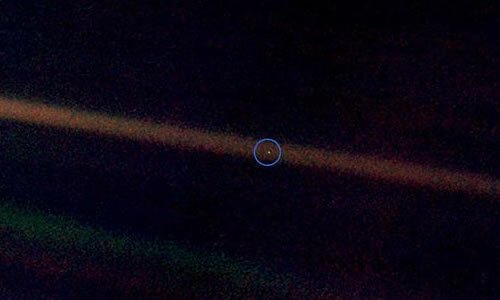 The “Pale Blue Dot” is a photograph of planet Earth taken in 1990 by the Voyager 1 spacecraft from a record distance of about 6 billion kilometres from Earth. Unfortunately, the paper detailing the 1962 Mariner 2 photometry is pay walled. The earth tracking system aboard the Mariner 2 spacecraft has collected photometric observations of the earth as a by-product of its navigational duties on the flight to Venus. The observations show good agreement with the phase curve for the earth that was previously found by observing the earth-lit moon. Diurnal variations in brightness are correlated with the fraction of the earth’s disk covered by land. 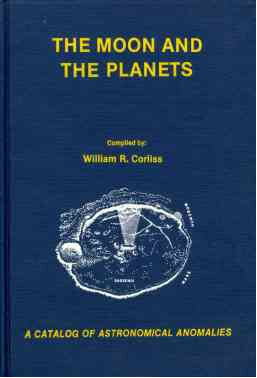 However, amongst the fascinating scientific anomalies catalogued by the late William Corliss, is an entry detailing the unexplained cycle of five or six days in the Mariner 2 photometry [of the Earth]. Mariner 2 kept an electronic eye on the Earth as it flew past Venus back in 1962. In order to keep its orientation in space, the satellite eye reported via radio the brightness of the Earth’s image at increasing distances. Meaningful signals came back to Earth for 52 days in the middle of the flight. Analysis of this data revealed two cycles in the Earth’s brightness. One cycle is daily, the other requires five or six days. In the analysis which was published in the Journal of Geophysical Research, Robert L. Wildey of the Mount Wilson and Palomar Observatories in California say there is no obvious explanation for that six day cycle. “Our Blue Planet’s Light Rhythm”, Cycles, 24:143, 1972. William Corliss concluded that “a daily variation in the Earth’s brightness, when seen from afar, is easily attributable to the rotating cloud cover; but there is no obvious explanation for a 6 day period in albedo.” The mainstream seems too agree and have quietly buried this anomalous photometry. There have been many advances in solar science in the last fifty years and Mariner 2 played a very important [early] role in advancing our knowledge of the Solar Wind. The solar wind is a stream of charged particles released from the upper atmosphere of the Sun. It mostly consists of electrons and protons with energies usually between 1.5 and 10 keV. The stream of particles varies in temperature and speed over time. Ironically, the key to resolving the mystery of the periodic changes in the Earth’s brightness is the Solar Wind speed data recorded by Mariner 2. Mariner 2 data reveals an average period of 5.58 days between peaks in the Solar Wind Speed. This matches the cycle of “five or six days” in the Earth’s brightness in the Mariner 2 photometry. 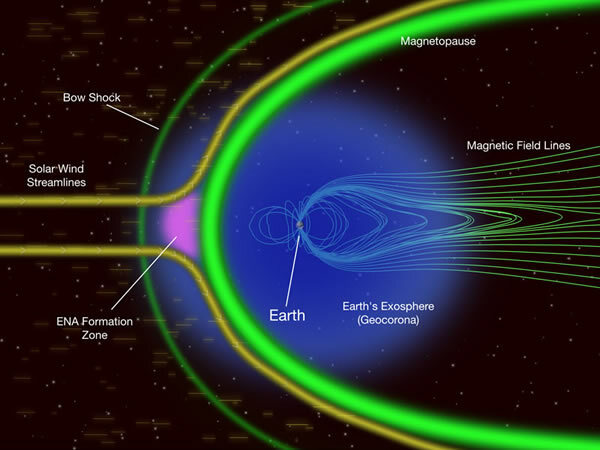 Interestingly, the Earth’s magnetosphere has been described as “a sieve” because it allows charged particles [from the Solar Wind] to enter the Earth’s magnetosphere. A magnetosphere is the area of space near an astronomical object in which charged particles are controlled by that object’s magnetic field. Near the surface of the object, the magnetic field lines resemble those of an ideal magnetic dipole. Farther away from the surface, the field lines are significantly distorted by external currents, such as the solar wind. The Earth’s magnetopause has been compared to a sieve, as it allows particles from the solar wind to enter. The IBEX spacecraft has found that Energetic Neutral Atoms, or ENAs, are coming from a region just outside Earth’s magnetopause where nearly stationary protons from the solar wind interact with the tenuous cloud of hydrogen atoms in Earth’s exosphere. Unsurprisingly, the charged particles [from the Solar Wind] collide with particles in the exosphere. The collision of electrons [from the Solar Wind] with hydrogen [and helium] atoms in the exosphere will frequently result in the emission of photons by the atomic gas particles. Additionally, protons [from the Solar Wind] can recombine with electrons [in the exosphere] to form additional neutral hydrogen atoms which can collide with electrons [and subsequently emit additional photons]. Below is an animation of how the blue line of hydrogen is made. The [hydrogen] electron is excited into the fourth state by a collision with another electron, then it goes back down to the second state and emits the turquoise photon. Then it quickly returns to the ground state, emitting a UV photon which our eyes are not sensitive to. Other lines come from other transitions. Each element has a different set of energy levels, so it absorbs and emits different photons and thus has different lines. 1) The speed of the Solar Wind determines the flow of charged particles entering the exosphere. 2) Atomic gases [in the exosphere] fluoresce when they collide with Solar Wind electrons. Gallery | This entry was posted in Astrophysics, Books, Earth, Science, Solar System. Bookmark the permalink. Do other Satellites confirm the 5/6 day period, or isn’t anybody looking? 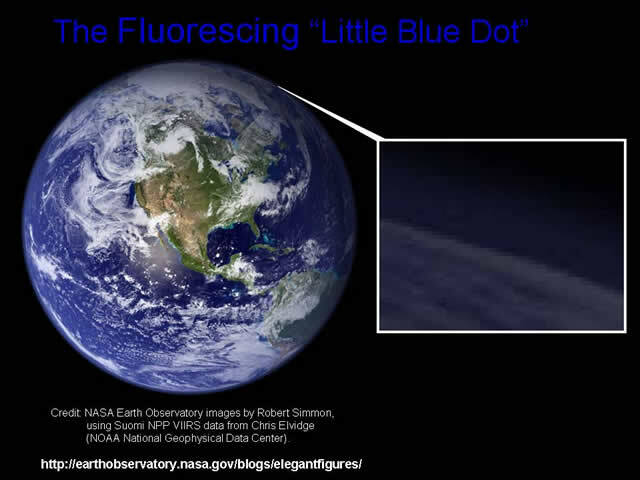 Observations of “Earthshine” do reflect the solar cycle where fluctuations in the “solar ultraviolet spectrum” and/or “the solar wind” will drive the variations in fluorescence.